Yes, we have all heard phrases like 'control the centre'. I would like to know the concrete reason why the centre of the board - in particular the 4 squares - e4, e5, d4, d5, are considered important in chess. What makes them different from any other square? What is the reason that these squares supposedly enjoy such a privileged status compared to other squares? Are they important only in the opening and not so important in the middle and end game? Why? Or is it all just a myth? 1. Greater influence over the board. Normally, if you control the center, then your pieces have more control over the whole board in general. Thus, a knight centralized on e5 generally controls more important squares than a knight passively placed, say, on a4. Karpov vs Kasparov World Championship Match (1985), Game 16 - Kasparov anchors a Black knight on d3 which was famously described as the "octupus", controlling several key squares in White's position and greatly influencing the entire board. White's knights on the other hand are pushed to passive squares like a4 and b1, exerting almost no control over the board. 2. Greater mobility of pieces. Often, if the central pawns are not advanced two squares, they can hinder the bishops from development. They provide less space for the pieces to move. If these pawns are advanced to the central squares, then the mobility of the pieces is greatly enhanced. Thus, e2-e4 frees the bishop on f1 and d2-d4 does the same for the bishop on c1. Besides, these moves also make room for the queen on d1 and later for the rooks to come into the game on the d or e files if they have been opened. Paul Morphy vs James McConnell, 1849 - Morphy follows basic opening principles; develops pieces towards the center, advances pawns to e4 and d4, his bishops come to life and the Black queen is at the mercy of his centralized pieces. 3. Restricted mobility of enemy pieces. Suppose white manages to place both pawns on d4 and e4. This makes it difficult for the Black bishops to find good squares like c5 or f5. They thus have to remain passive or try a fianchetto, which might not always be convenient. Also, the pawns on d4 and e4 restrict and also have the ability to attack the Black knights which might normally be developed on c6 or f6. This constant potential to threaten the Black knights can make it difficult for Black to develop pieces comfortably. Karpov vs Kasparov World Championship 1986, Game 5. - Karpov demonstrates how pawns in the center can restrict a fianchettoed Bishop. 4. Pawns move closer to the enemy king. Generally, in an attack on the enemy king, it is important to have a few pawns near the enemy king to make it difficult for the opposing pieces to defend the position. If the Black king (for example) castles to the kingside, then it usually helps White to have a pawn on e5, because then Black cannot place a knight on f6, which is the most natural defensive position for the knight on the kingside. Fischer vs Myagmarsuren, 1967 - Bobby Fischer fixes a pawn on e5 to drive the Black knight from f6 and then proceeds to win with a kingside attack in instructive fashion. 5. A favorable exchange of pawns in the center leaving the enemy camp with weaknesses. Normally, when pawns are placed in the center, the opponent has to challenge them at some point in the future. This can often lead to favorable pawn exchanges and may lead to isolated pawns or backward pawns in the enemy camp, which can be vulnerable in some positions. Rubinstein vs Salwe, 1908 - Here, Rubinstein creates a backward pawn on c6 and then masterfully exploits it. As I mentioned, these are the end results that a side tries to achieve by controlling the center. If the end result is already achieved, or if it can be obtained in a better way, then there is no need to control the center. In addition to things already said, notice that pieces have more moves if they're in the center of the board. 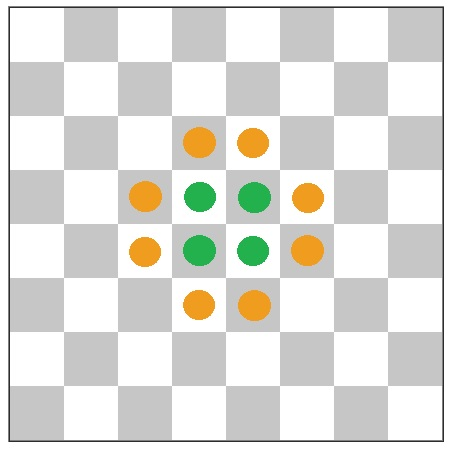 E.g., a knight on one of the squares in the 4x4 space in the center has 8 moves; as the knight moves towards the edge, he has fewer moves that he can make. It is the same with the other pieces. Books with precise speech will say that what's important is to control the center, not necessarily be in the center -- an important difference. Just having pawns in the center, for instance, would not get you any advantage. They need to be controlling one or more squares that pieces can use. It is certainly not a myth! As pointed out control of the centre squares either by direct occupation with pieces or pawns or indirectly via major and minor pieces gives more control over the chess board. Pawns and pieces in the centre of the board affect the most squares compared to being on the outer flank squares and those on the board edge squares exert the least control of the board. If you don't control these centre squares and let your opponent control them, they will have an easier game than if they have to fight for their control (so don't concede the centre without some other form of good compensation or you will regret it against any good player whose pieces and pawns in the centre will in effect be stronger!). Some games are classed as open/semi-open or closed. Central openings often give rise to open or semi open games where centre files may become fully open or semi-open (ie with only one pawn on the file or no pawns). In open games pieces can be used more to control the centre. In closed games the pawns are supported and make it harder for the pieces to find good squares. Some openings are designed to take central control. In the aggressive Sicilian defence black tries to exchange his c pawn for a centre pawn of white and try and control the centre that way. The Scandinavian opening immediately challenges the centre. This central control concept does hold true more in the opening and midgame than the end game. In the endgame with only Kings and pawns left, other factors are more important (eg pawn structure, numbers and king position). Still like many principals in chess there is more to chess than controlling the centre, but if you can control the centre you will have an advantage! This though does not mean you should neglect the flank/outer squares. If you let your opponent attack at will on the flanks with pieces and/or pawns you will be at a disadvantage too. So you need to be alert ("on the ball") in chess over the whole board and if you do concede the centre then beware! Is it better to reply to 1.Nf3 with …d5 or …b5? Centre pawn vs. side pawn?